Welcome Hunters & thanks for visiting! LinkedIn members get 10% off! Aspirantic analyzes developer activities using machine learning to support the qualification of software engineers and designers, resulting in better hiring decisions. They are actively contributing code to open source projects on Github, ask and answer technical questions on StackOverflow, or meet with other geeks on Meetups. Aspirantic will help you identify these talents and will put you in touch with your perfect match! Candidates are technically ranked with a Skill-score. Search social media profiles that are currently not searchable! We identify candidates based on their online activity. We leverage data from social media profiles and online activities. With a big data index of billions of web pages, we discover and evaluate developer skills based on their contribution activity. This enables Aspirantic to deliver more skilled talent than any other business site or search engine. We analyze over 200 million lines of source code. 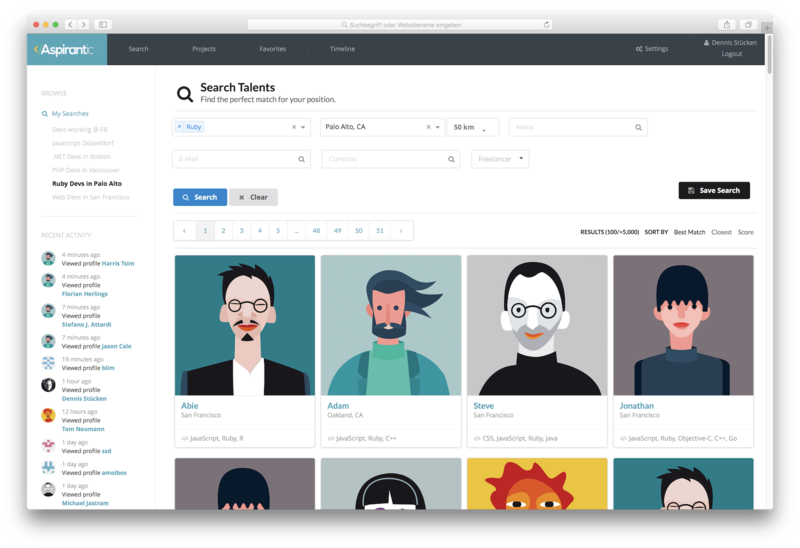 We uncover profiles that aren't available on Linkedin or Xing. We aggregate candidate profiles from several sources. See how Aspirantic enables your team to recruit the best engineers and designers.